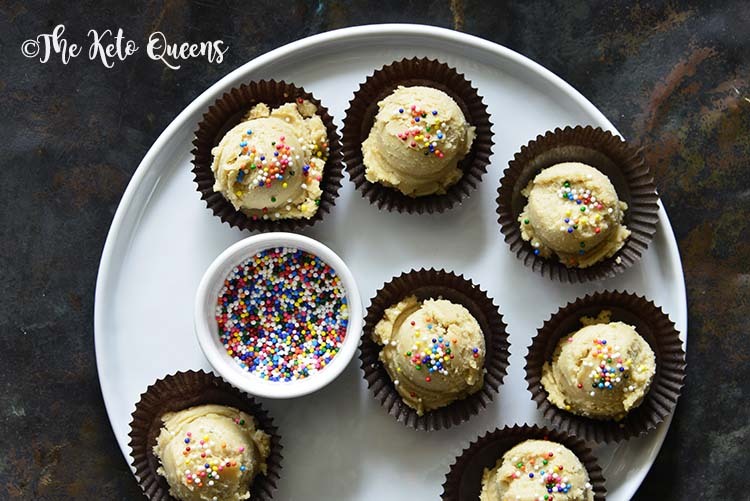 Keto Edible Sugar Cookie Dough Fat Bombs are a delicious way to satisfy your sweet tooth and help you get in your healthy fats to stay in ketosis! We love keeping a batch of keto fat bombs stashed in the fridge for those days when we need to up our fat intake…and for those days when we need just a little something sweet! If edible cookie dough is your thing (and let’s be real, who isn’t a batter-licker from way back? ), then these are the fat bombs for you! Our Keto Edible Sugar Cookie Dough Fat Bombs taste like the real deal and will help you stay in ketosis. Sugar cookie dough to make sugar cookies is usually a mixture of the following ingredients: butter, sugar, egg, vanilla, all-purpose flour, baking powder, and salt. Cream together the butter and sugar, and then beat in the egg and vanilla. Subsequently, stir in the dry ingredients. Some recipes call for chilling the dough and others don’t. You can scoop the dough onto baking trays, or roll it into balls and arrange them on baking trays. After that, a lot of sugar cookie recipes call for rolling the balls in sugar, or greasing the bottom of a glass with butter, dipping it in sugar, and using it to press down the dough balls before baking. Of course, this is NOT the keto way and you know we had to keto-fy it! In its most basic form, edible sugar cookie dough is very similar to regular cookie dough, but without eggs. 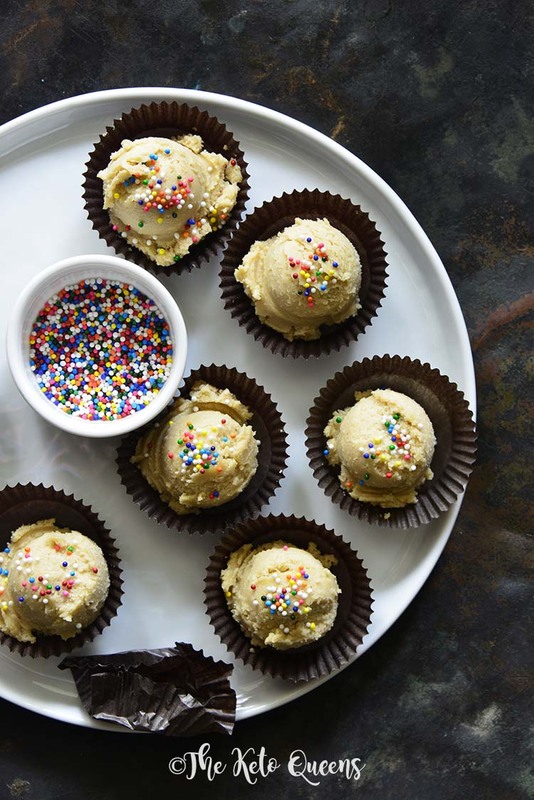 Regular edible sugar cookie dough typically contains a combination of butter, sugar, flour, salt, vanilla, sometimes milk, and usually sprinkles. Paleo versions of edible sugar cookie dough usually use almond or coconut flour instead of all-purpose flour, and sometimes honey or maple syrup as the sweetener. 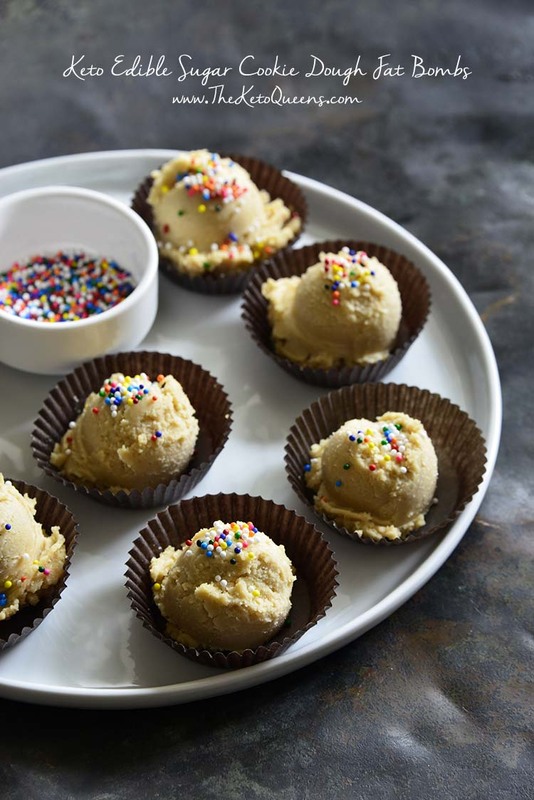 This Keto Edible Sugar Cookie Dough Fat Bombs recipe uses a mixture of healthy fats, almond flour, low carb-friendly sweetners (erythritol and stevia; the little hint of molasses is there for depth of flavor, not sweetness), and flavorings. Here the flavorings we went with are vanilla extract, almond extract, and a touch of nutmeg to give this edible sugar cookie dough a little something special. You won’t be able to pull out the flavor of nutmeg, but you’ll know there’s something in this recipe that you can’t quite put your finger on that takes it over the top! Fat bombs are low carb, high fat treats. They can be either sweet or savory, but they’re more commonly sweet and are often thought of as a keto replacement for candy. When you’re following a ketogenic meal plan, keto fat bombs serve two purposes: 1) they satisfy cravings for sweet treats and help you stay on track, and 2) fat bombs help you get in your healthy fats and keep your macros on-point. If you haven’t made fat bombs before, you’ll be surprised at how easy they are to whip up. We combine our healthy fat of choice (in our recipe for Keto Edible Sugar Cookie Dough Fat Bombs we use cream cheese and butter), add a thickener if necessary (here we use almond flour), add sweetener of choice, and any flavorings you like! Then beat everything together with a handheld electric mixer, refrigerate the dough until chilled, and scoop it into balls. Note that most fat bombs will get soft at room temperature and should be stored in an airtight container in the fridge. Cream together the cream cheese and butter, and then beat in the almond flour, Swerve Confectioners, vanilla, molasses, almond extract, stevia, baking soda, salt, and nutmeg. Cover and refrigerate until the dough is firm enough to scoop into balls, about 2 to 4 hours. Divide into 12 equal portions, top with a few sprinkles if desired, and store covered in the fridge. I made these and they are delicious! I then entered the recipe into MyFitnessPal.com to log them. MyFitnessPal calcs these at 3 carbs a piece! Why is there such a discrepancy between the nutrition info you provide in the recipe? The largest carb contributors are the almond flour (10 carbs at 1/2 cup) and the confectioners Swerve (16 carbs at 4 teaspoons). Does my fitness pal take into account the sugar alcohols which are technically a carb but do not cause a spike in insulin, so we subtract that number when calculating net carbs. Okay, I cannot nfess I cannot follow a recipe, but I was close enough to say this is my new favorite. I used cake batter flavoring instead of vanilla, brown sugar swerve instead of regular, no stevia drops. My mind is reeling with the possibilities for endless variations. Thank you for helping me stay true to Keto. It is saving my life.